Hi <>, Happy New Walking Year!! Hi <>. Happy New Walking Year To You. A little inspiration for winter walking this month and a request for your help on our new look. Happy New Year To All Our 50 Plus Walking Friends. 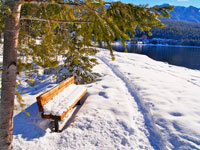 Are you one of the fortunate walkers who get to enjoy the wondrous winter sights on your daily walks? One thing for sure is that you are indeed the lucky ones who captures nature with her four seasons to remind us that there is a reason for the seasons. Through the cold and the snow, there is a feeling of trust that a promise of a warmer season is just around the corner. For now, let's just enjoy the beauty of winter. It is significant that many of us associate the holiday season with winter. That association immediately brings the feeling of warmth and love to many of us. We grew up with the comfort and joy of the family togetherness at this time of the year. As you walk to your favourite spots in the new year, let's remember to be thankful for the many different opportunities that nature provides us. And of course, keep fitness walking in mind, no matter where you walk. May this new year bring you success in reaching your walking goals and result in a happier, healthier and fitter "you". Tell us what you think of the new and modified 'look' you can see on our Home Page. Does the new look and feel work for you? Does it help you find what you're looking for? Do the six areas on the Home Page interest you the most? Are there other areas you prefer? You can take a peek at the over 70 topics we cover on our Site Map to refresh your memory. Have a peek and see if some of those others would be higher up on your list. 1. Is this new look an improvement for you? 2. Are there topics other than the six shown on the Home Page that interest you more? Thank you so much everyone. Your feedback is essential to us.